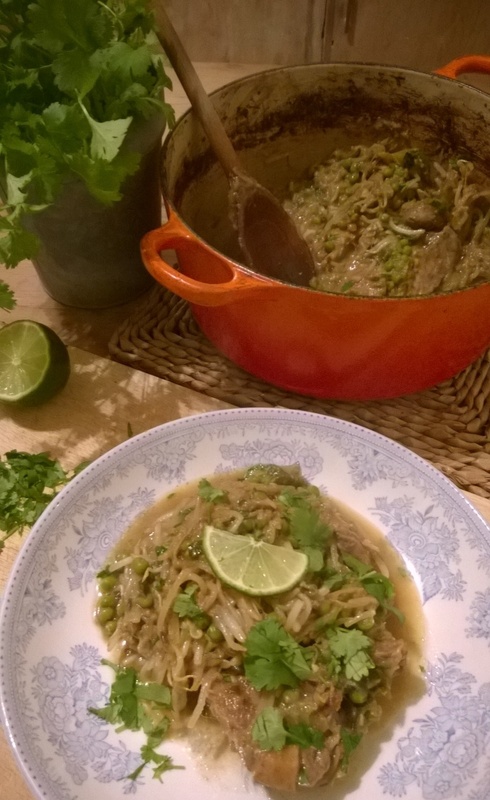 Spicy Ginger ‘One-Pot Pork’ With Beansprouts, Coconut & Coriander – Substantial & Filling, High in Flavour, Low in Carbs! The evenings are starting to draw in ever earlier, and at such times we instinctively crave something that’s quick and simple to prepare, yet has the robustness and filling quality of a good home-cooked meal. Well this dish delivers on every level. The flavours are rich and exotic, proving that a deep and complex taste needn’t be complex to prepare! I really love this style of one-pot cooking. After work when you’re just wanting to relax and unwind; no-one relishes a recipe to be fussed over, culminating in a slavish pile of washing-up. And besides; there’s something indescribably comforting about a big substantial pot of food, all served up in brimming ladle-fulls; it warms the heart and soul alike; not to mention the eye and the stomach! Low-carb dishes can sometimes feel a little on the anaemic side, so dishes like this, which leave you luxuriously full are always welcome! And because the carbohydrate content is so low, this recipe is perfect for diabetics and anyone following a ketogenic- / paleo-regime. Vary the vegetables according to what you have to hand. Just make sure they keep to the keto-go-go guidelines (hyperlink here)! Start by placing a heavy based pan onto the hob over a medium heat with a little oil, ready for your pork. I used pork shoulder-steaks for this recipe, but any reasonably quick-cook variant will do, such as loin, diced cuts or leg-steaks. Place your pork into the hot pan, making sure to season well & enjoy the hissing and spluttering as the meat hits the searing metal. Brown lightly for a couple of minutes whilst you set about preparing the ‘flavour part’. When it comes to things like chilli, we’re all different. I like it really hot, but others may be more of the sensitive type. I used 3 large red chillies here, but feel free to go green or smaller, such as bird-eye chillies. Scotch bonnets will also promise you a definitively committal adventure! Either on a chopping board or in a food processor, roughly chop chilli, garlic and ginger then add this to the pan. I used three small cloves of garlic, the chillies as above and a thumb-sized piece of ginger. Freeze-dried ginger or even powder will work equally. If you’re using powdered form, then add this when you add the other spices later. Stir the mix thoroughly into the pork, then chop your vegetables. As I say above, use whatever you have in stock. My mix went as follows: 1 large onion, 1 leek (plus green-tops), 1 courgette, 1 green pepper. Roughly chop these, as the French would term ‘a la Paysanne’. Once hacked to a pleasing and inexpert inconsistency, add to the pan and stir well. Now for the spices. Sprinkle in a generous teaspoon of ground all-spice (not mixed spice [think cake], but all-spice berries), followed by a teaspoonful of ground cumin. Season well and then crumble in a couple of chicken stock cubes, or fresh stock if you’re sufficiently organised. If you’re using dehydrated cubes, pour in a centimetre’s depth of water and mix in. If liquid stock, then up to the same depth as per water above. Leave this to simmer and reduce for a few minutes, then add condensed coconut block or coconut cream. You can of course use canned coconut milk, but if you choose this option, be careful to not add the water or liquid stock quantities above. One of the joys of this dish is the thick sauce. If it goes too watery then you end up with more of a soup, rather than the satisfying filling quality of a hearty wholesome casserole. Stir in a good handful of frozen petits-pois for bulk (or as low carb frozen peas as you can find), then into a preheated oven it goes (circa 180-190°c, gas mark 5) for 20 minutes with the lid on, to cook through and thicken nicely. We want no more than 2cm’s depth of liquid in the pan when it goes in. The organised amongst us will use this interim time to do the washing-up & tidy the kitchen. The indulgent amongst us will grab the time to read a book or have a well-deserved sit down! I leave that choice up to you! However you fill it; once the princely period is over; take the pan out of the oven and stir thoroughly. Then tip in your beansprouts (large packet circa 300g for x2 people) and place the pan back into the oven for 5 minutes further. This allows the beansprouts to wilt and heat through. Your last task is to roughly chop coriander leaves. If you’re feeling rustic, then tear them on with your hands, which fills the room with a wonderfully verdant citrus aroma. Interestingly, if you chose to spend the ‘oven time’ by doing the washing-up, then you might be more of a ‘knife and chopping board type‘ when it comes to the final hurdle of herbs! The indulgent set tend to use the hands! Whatever your route, simply scatter the herbs on top and spoon into deep earthy bowls. Then once served, continue the spooning once more, but this time from the bowl upwards! In a word – delicious!